As that special time of the month approaches, do you notice your skin start to take a turn for the worse? Many of us notice acne breakouts tend to appear right around our period. And, of course, on top of breakouts, we have bloating, fatigue, temperament changes and more to worry about. To help combat the acne breakouts, we at Comforté have a few quick tips to follow for healthy skin all month long. In the week before your period, you may notice your skin becomes shiny because of the excess oil production, causing your pores to clog. This is where many breakouts start to occur. You may also notice cystic acne (the painful underground lumps appearing under the chin and jaw line). To help reduce this problem, you can modify your diet, cutting out dairy, sugar and refined carbs. Just make sure your meals all come with a nice serving of protein to keep your blood sugar stable and reduce the inflammation that causes pimples. During this week, we also recommend exfoliating a few times. We like to use enzyme scrubs, because they are a bit gentler and will not be as irritating as others. When your period does arrive, your skin will be extra sensitive. Our tip for this week is to hold off on any waxing, laser hair removal and acne extractions. They will be extra painful this week, so do your best to avoid the pain and hold off! When your period is finally over, you may notice your skin is pristine once again, and you may fall off the skin care wagon. Just remember, it is important to keep up your regiment so next month will not be the same as last. Continue protecting your skin from the sun, exfoliating and washing your face – you will thank yourself in a few weeks when your visitor is back in town! Read here for additional tips and information. 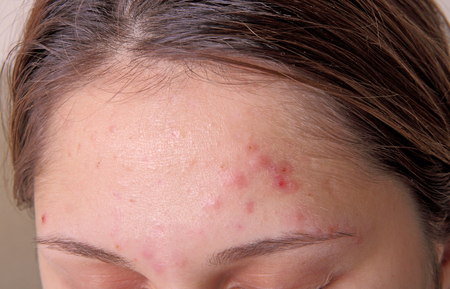 This article may also help you fight acne during your period.